Display precise voltage and battery battery status and selects the appropriate charging mode. 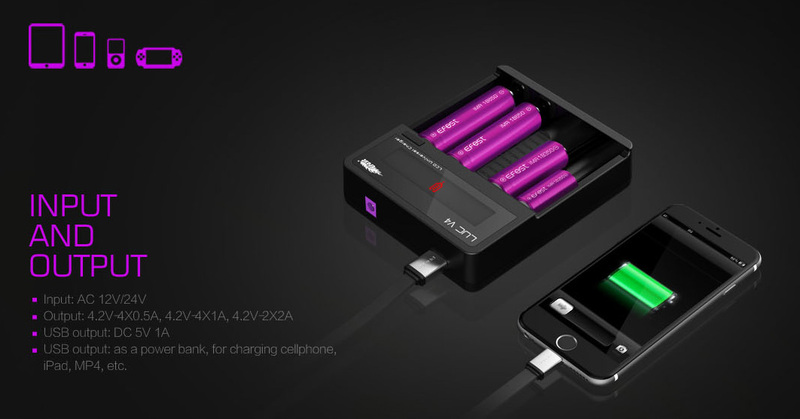 Capable of charging 4 batteries simultaneously, each slot displays charging status independently. In channel 2, LUC V4 can also charge devices such as mobile phones, iPad, MP3 players, PSP etc. LUC V4 charger is compatible with most 3.7V Li-ion or LiMn batteries like 10440, 14500, 14650, 18500, 17670, 18350, 18650, 18700, 26500, 26650 etc.It can charge 15270 or 14250 batteries with spacers.